We have been in the mountains of Wirikuta in our place arriba la luna overlooking the zocolo and the wonderful pueblo that the Spanish called Catorce. Here, our days consist of lots of good reading, drinking and eating, plenty of rest, good conversations with our many friends from all over the World, and as soon as our red blood cell count allows it, great hikes through these mountains. One of the leading trips is the one to Quemado. Folks come from all over the world to make the pilgrimage to this Holy site. To this day, the Huichole bring their young and their initiates here to bring them into the rights and rituals of this unique tribe that still lives much as they did before the Europeans came onto their lands. We were saying the other night while visiting with friends that here in Mexico, time is wide. You might see a man with his donkey hauling flowers and the next moment pass an internet cafe full of tech savvy, internet surfing citizens of the world. Mexico is a place full of ambiguities, mystery, and uncertainty. We made this movie to help capture part of the beauty and the depth that is Real de Catorce. There has been a remarkable counter attack by those who cannot or will not abide the reality that burning fossil fuels endangers us all. I liken it to the Battle of the Bulge at the end of World War II. It is a brilliant plan, one that will delay the coming day of reckoning by years at least. The idea that there has been some kind of scientific chicanery in the hallowed halls of our national academies, that climate change science is a hoax has come of age of late. No longer is it unsafe to oppose virtually all of science. Right wing entertainers are having a field day as winter does what it does. But this weekend, Al Gore's opinion piece appeared in the New York Times. It responds well to this well choreographed attack by the far out right. It is true that the climate panel published a flawed overestimate of the melting rate of debris-covered glaciers in the Himalayas, and used information about the Netherlands provided to it by the government, which was later found to be partly inaccurate. In addition, e-mail messages stolen from the University of East Anglia in Britain showed that scientists besieged by an onslaught of hostile, make-work demands from climate skepticsmay not have adequately followed the requirements of the British freedom of information law. 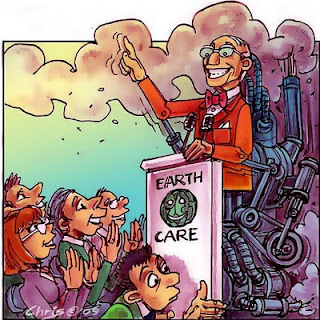 Over the years, as the science has become clearer and clearer, some industries and companies whose business plans are dependent on unrestrained pollution of the atmospheric commons have become ever more entrenched. They are ferociously fighting against the mildest regulation — just as tobacco companies blocked constraints on the marketing of cigarettes for four decades after science confirmed the link of cigarettes to diseases of the lung and the heart. Simultaneously, changes in America’s political system — including the replacement of newspapers and magazines by television as the dominant medium of communication — conferred powerful advantages on wealthy advocates of unrestrained markets and weakened advocates of legal and regulatory reforms. Some news media organizations now present showmen masquerading as political thinkers who package hatred and divisiveness as entertainment. And as in times past, that has proved to be a potent drug in the veins of the body politic. Their most consistent theme is to label as “socialist” any proposal to reform exploitive behavior in the marketplace. We have overcome existential threats before. Winston Churchill is widely quoted as having said, “Sometimes doing your best is not good enough. Sometimes, you must do what is required.” Now is that time. Public officials must rise to this challenge by doing what is required; and the public must demand that they do so — or must replace them. And these climate change deniers really are.